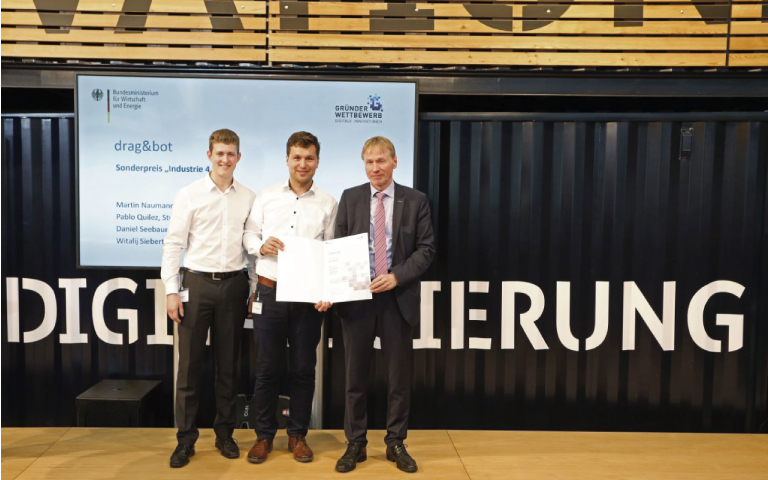 Another important award was the special prize ‘Industry 4.0’ served by the Federal Ministry for Economic Affairs and Energy in the context of the Gründerwettbewerb – Digitale Innovationen ‘Entrepreneurial Competition – Digital Innovations’ at the HANNOVER MESSE 2018. With this award the institution aims to support digital entrepreneurial ideas and to help entrepreneurs founding a company. Their prizes not only include financial grants but also individual coaching and consultation services. This year, 169 teams participated in the competition. Drag&bot won the special prize for ‘Industry 4.0’. This prize included a €10,000 check! Wolfram Groß – the project coordinator of the competition praised all winners saying that they are lateral thinkers, visionaries and innovators with clever minds. We highly appreciate the honor given to drag&bot and thank the Federal Ministry of Economic Affairs and Energy for choosing us.